Bible scholarship of the past 150 years has placed much attention on a very small number of manuscripts. While there are over 5000 known New Testament manuscripts, attention has been placed on less than ten. Of these, Codex Sinaiticus and Codex Vaticanus have been exalted as the “oldest and best” manuscripts. The oldest claim has been disproved elsewhere. This document will focus on the nature of these two favored manuscripts. Sinaiticus has been recently made available to all on the internet by the Codex Sinaiticus Project, with the mainstream media and general Christians fawning over this “world’s oldest Bible.” This manuscript, in conjunction with Codex Vaticanus, form the basis for most modern Bible translations. However, these two manuscripts differ substantially from the text of the bulk of the manuscripts. Thus, the public needs to know the truth about these manuscripts. Contrary to what has been taught in most seminaries, these two manuscripts are worthless, and hopelessly corrupt. Dean John Burgon, a highly respected Bible scholar of the mid to late 1800’s, wrote of these manuscripts, “The impurity of the Texts exhibited by Codices B and Aleph [Vaticanus and Sinaiticus] is not a matter of opinion but a matter of fact.”1 These documents are both of dubious origin. It has been speculated by some scholars that one or both were produced by Eusebius of Caesarea on orders of Emperor Constantine2. If this is true, then these manuscripts are linked to Eusibus’s teacher Origen of Alexandria, both known for interpreting Scripture allegorically as opposed to literally. Scholars have designated these manuscripts as Alexandrian, linking them with Alexandria, Egypt, the region responsible for early heresies such as Gnosticism and Arianism. Both are dated in the mid to late fourth century. The figure below gives an example of Sinaiticus’ many corrections. As you can see, it looks like a much-corrected rough draft. Which is the Word of God, the original text, one of the many corrections, or none of the above? Sinaiticus also includes spurious, uninspired, apocryphal books, including 2 Esdras,Tobit, Judith, 1 & 4 Maccabees, Wisdom and Sirach in the Old Testament. In the New Testament, the Epistle of Barnabas and the Shepherd of Hermas are added. New lay interest in this manuscript may be intended to create demand for an English translation of it. An 1861 translation of Sinaiticus’s New Testament has been placed online, including the Epistle of Barnabas and the Shepherd of Hermas.16 These two false writings (Epistle of Barnabas and Shepherd of Hermas) promote New Age and Satanism17. Is a resurgence in public interest in Sinaiticus and Vaticanus intended to bring acceptance of heretical works like these into Christian circles? Why would one of the top Bible scholars of his day make such remarks of manuscripts considered the “oldest and best” by others? Burgon had personally examined these two manuscripts, and noted that their text differed greatly form that of 95% of all manuscripts. When examining the Gospels as found in Vaticanus, Burgon found 7578 deviations from the majority, with 2370 of them being serious. In the Gospels of Sinaiticus, he found 8972 deviations, with 3392 serious ones.19 He also checked these manuscripts for particular readings, or readings that are found ONLY in that manuscript. In the Gospels alone, Vaticanus has 197 particular readings, while Sinaiticus has 443.20 A particular reading signifies one that is most definitely false. Manuscripts repeatedly proven to have incorrect readings loose respectability. Thus, manuscripts boasting significant numbers of particular readings cannot be relied upon. These ancient MSS owe their preservation not to the providence of God, but to the neglect of man. In these last days, Satan is doing everything in his power to prepare men for the great deception of the Antichrist. As Sinaiticus has been exalted in the public’s eye by the Codex Sinaiticus Project, I would not be surprised if Vaticanus is also exalted and placed online for all to see and venerate. These manuscripts may be the driving force to get “Protestants” to accept the Apocrypha as well as the Epistle of Barnabas and the Shepherd of Hermas, books so heretical that even the Roman Catholic Church does not accept them as Scripture. We need to be alert, and not fall for these manuscript idols. We also need to be aware that most Bible versions, other than the KJV, rely heavily on these manuscripts. The NKJV, while using the correct text, includes “alternate readings” from Sinaiticus and Vaticanus in the margin. (Such as “The oldest MSS. say…”) We need to reject these for the tried and true King James Version. 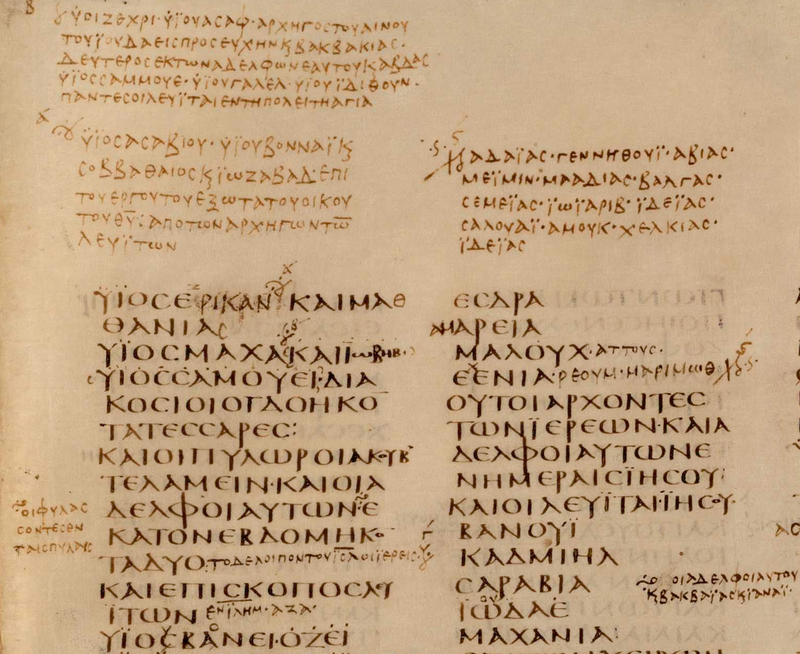 2 T. C. Skeat, The Codex Sinaiticus, the Codex Vaticanus and Constantine. JTS 50 (1999), pp. 583–625. 3Benigni, Umberto. “Codex Vaticanus.” The Catholic Encyclopedia. Vol. 4. New York: Robert Appleton Company, 1908. 24 Jul. 2009 . 23Hoskier, H. C., Codex B and Its Allies, a Study and an Indictment, London, 1914, p.1.